Are you moving to Fayetteville, AR or considering it? Then, you’ll want to be sure to read this article first! What’s there to love about Fayetteville, AR? Plenty! Here are five reasons you’ll love moving to Fayetteville, AR. Located in the growing region known as Northwest Arkansas, Fayetteville has something people need: jobs. The Northwest AR area is the birthplace of Walmart, home to a community of Walmart vendors, and the headquarters for Tyson Foods. Together, with Bentonville, Rogers, and Springdale, it has transformed from a small town to a center for higher education, culture, commerce, and entrepreneurs. Due to the High ranking value by U.S. News World Report and the affordable cost of living makes Fayetteville a premier place to live and work. The U.S. News and World Report ranking ranked Fayetteville at a 9.1 for value, and CBS New Moneywatch named it the fourth cheapest city in America. available, a flood of newcomers found themselves moving to Fayetteville. This influx over the past several years has pushed housing prices up and enticed real estate developers to build. While homes in Fayetteville are on the higher end of the market in Arkansas, the city’s median home sale price is about $50,000 below the national average. People from all over the world are moving to Fayetteville and making it their home. Why? Aside from the already mentioned perks, it may have a bit to do with the people. Newcomers often comment on the friendliness of the residents. It’s not unusual to see people wave and smile at each other in the street. 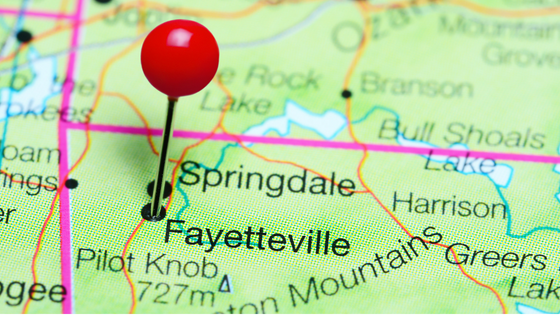 Being nestled in the Ozark Mountains, Fayetteville’s population has grown for many reasons. One being its beauty. Fayetteville attracts outdoorsy types with its abundance of state parks, acres of community green space, playgrounds, parks, and walking trails. Life in Fayetteville is a hiker’s and an adventurer’s paradise. Not the outdoorsy type? No problem! The city is also chocked full of activities for the pavement dweller as well. Residents have plenty to keep them entertained at the first-class performing arts center. Or, tempt your taste buds with the delicious local cuisine. And, since Fayetteville is home to the University of Arkansas Razorbacks, sports fans have plenty to choose from when it comes to sporting events. Fayetteville also features a wide variety of live music venues and has a dynamic festival scene. You’ll have all you could ever need or want in a city to work, live, and play in. Need more reasons for moving to Fayetteville? Experience Fayetteville here. When you choose to Fayetteville, you are selecting one of the best places to live in America. Fayetteville’s thriving job market, great house values, affordable cost of living, population growth, community focus, and beauty, it’s an excellent place to live and work. What’s not to love! Are you ready to find a house in Fayetteville? Then, you want to the best realtor in Fayetteville. Taylor Team Homes is dedicated to finding you the perfect place to hang your hat. Welcome home to Fayetteville. Hopefully, you enjoyed reading the five reasons you’ll love moving to Fayetteville. If so, share it with friends!